We have seen too many hungry people this year. Especially in India. And so I appeal to you again this year to pledge a few of your dollars toward a Menu for Hope prize, all proceeds of which will go to the UN World Food Programme. Last year’s campaign was a smashing success, with $62,925.12 raised from food lovers, bloggers and other good people all over the world. Let’s aim even higher this time around. This year, I have something super special to offer: a bag of the world’s hottest chiles, straight from their source in Nagaland, in the far northeastern corner of India. Just look at that beauty! These chiles (known as Raja chile in Nagaland, or bhut jolokia in neighboring Assam state) made the Guinness Book this year as the spiciest peppers in the world, at more than a million Scoville Heat Units. Although the New Mexico State University Chile Institute is growing and selling bhut jolokia seeds, the only place on earth you will find these peppers fresh from the source is in northeastern India. Last month, while exploring Nagaland, I met a 50-year-old farmer named Kevisienuo who lives atop the steep slopes of her village, some 5,000 feet high. She invited me into her kitchen and insisted on offering me gifts. 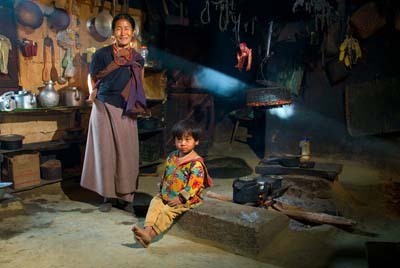 That’s Kevisienuo pictured above, with her little girl by the fire and a baby strapped to her back. If you look closely, you might be able to make out the basket of chiles she had drying over the fire, illuminated by a ray of sunlight through the window. Kevisienuo’s face beamed when I told her about Menu for Hope. She grabbed a stash of her home-grown chiles, heaping them into a bag for me to take, more than 50 to offer as a prize that will garner money to help feed the worldâ€™s hungry. (One pepper offers enough heat to satisify the toughest chile addicts and make average eaters cry!) Kevisienuo grew these peppers in her field, several kilometers away, straight down the mountain. She dried them over her kitchen fire, infusing the peppers with smoke. She said it was a blessing for her to be able to offer this gift. And so, readers, if you like spicy food, please consider bidding on these peppers in this year’s Menu for Hope (prize code AP07). Each $10 ticket gets you a shot at the prize of your choosing. If you don’t like spicy, no worries: all manner of prizes from all corners of the earth are found in this year’s prize pool. See a roundup of offerings from the Asia-Pacific region at Grab Your Fork. And check out the options worldwide on Chez Pim. 2. Make a donation. Each US$10 will give you one raffle ticket toward the prize of your choice. In the personal message section of the donation form, please specify which prize or prizes you would like, and the number desired, using the prize codes provided. Naga chile prize code: AP07. 3. For US donors, if your company has agreed to match your charity donation, please remember to tick the box and fill in the information so Menu for Hope organizers can claim the corporate match. 4. Please make sure to tick the box to allow organizers to see your email address so they can contact you if you win. Your email address will not be shared with anyone. SPECIAL NOTE: Readers, please check your country’s customs and quarantine regulations before bidding on these chiles. Some countries do not allow international shipments of items that include seeds. I will ship these chiles to the winner, anywhere in the world. But I have no control over the actions of authorities on your country’s end. read an article on these chilies. I understood that these are too dangerous for the above average to hot chili eater.. am I over estimating the true “hotness” of the peppers…?? Andy, I wept at my first taste of a fresh one. Just the size of a pinhead. I didn’t even swallow it. But the endorphin rush is great. There’s a couple who live in Dorset, South-West England who grow a variety of the naga chilli and it has been acclaimed as the hottest in the world, blew the habanero right off the scoville map! Lab tests put the Dorset-grown Naga chiles at 960,000 SHU. Meanwhile, Gardeners’ World claims to have rated the Dorset Nagas at 1.6 million. But that study has not (as far I know) been verified or duplicated, and testing details remain sketchy. In any case, bhut jolokia (the Assamese name for these Naga chiles) was listed in Guinness World Records this year as the hottest on earth — based on years of tests at New Mexico State University’s Chile Pepper Institute, which came up with a rating of more than 1 million SHU. Call them what you will, these chiles are all a member of C. chinense species, with a few C. frutescens genes as well. Do you think Jerry will donate a picture to this event? Maybe of the chilies? Jojo, yes. 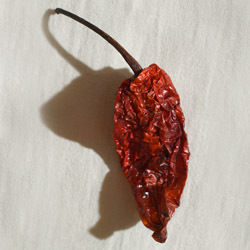 The winner of these Naga chiles also will receive the above photo of Kevisienuo in her kitchen. I am the person who won the chilis from the Food for Hope. Thank you so much for donating them. I bid on them for my husband who is a Master Gardener here in California. Every year they save pepper and tomato seeds and do trials on new plants, so these seeds will be an addition to their project. I didn’t check to see if they can be sent to California, and if there is a problem with that, then you should give them to the next highest bidder. Thank you. Nice discussion about Angami Chillies. I am gald that you liked the King Chilly. However, I must warn you not to take too much as it may cause body imbalance. Thank you, Alice. And welcome!